Recently we attended Exeter University with an invitation to contribute to a meeting of UAV enthusiast experts and scientists with an interest in using unmanned aerial vehicles in remote sensing studies. UAV’s are already used in individual studies all around the world, but Exeter University wants to develop a unique vehicle ready for off-the-shelf deployment with customisable instruments. Skye Instruments are currently developing a light weight product that will fit onto a variety of UAV’s using our world-renown sensors and taking our products to new heights(!). This package will allow users to take readings of both incident and reflected light from the UAV, and store this data in the logging unit. 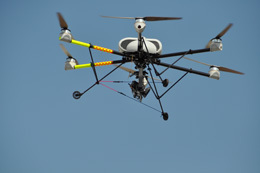 Our sensors have already been used in aerial studies, and have performed as well as they have on the ground. This means that remote scientists now are able to obtain data from a variety of scales – from a couple of metres on the ground with and NDVI pole, on a weather station (up to ~10m) on a flux tower (~40m), on a UAV, on aeroplanes, and of course from satellites. What is extremely useful about UAV’s are their relative cost-effectiveness compared to aircraft measurements, and the large amount of land they are able to cover as opposed to an individual/groups of individuals on the ground. They are very mobile, and easy to use, even for a beginner which gives them an advantage over static weather stations and flux towers. Please contact Skye if you would like to discuss your UAV project or would like further information regarding measurements using UAV’s.